No one from Riga mayor’s office will be fired and the recently dismissed chairman of Riga City Council Nils Ušakovs intends to continue working in his office. As journalists were told by Ušakovs on Friday, 5 April, employees of his office will continue working in the municipal administration. Next week it is planned to discuss changes to work organization so that office workers are able to assist active chairman of Riga City Council Oļegs Burovs and vice-mayor Vadims Baraņņiks. At the same time, Ušakovs said he does not plan to leave his office. He also said all costs associated with appealing the dismissal order in court will be covered from his personal wallet. 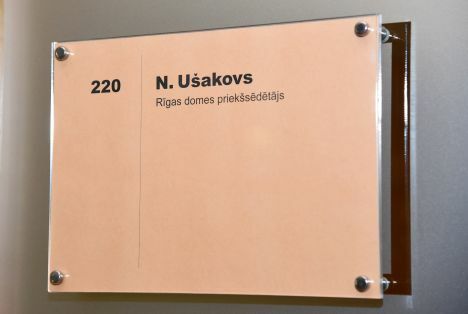 Commenting on the order issued by Environment Protection and Regional Development Ministry, Ušakovs told journalists that the ministry’s decisions was made not in law office but rather a place similar to Taureņu Bathhouse. He once again said he was surprised when he received «such poorly-made requests and dismissal order from the ministry». Ušakovs also claims that the ministry’s mentioned EUR 28 million that were allegedly not added to public transport company Rīgas satiksme’s base capital were not even intended for this. «This money was always considered compensation to the company for all groups of residents who use services for free. The minister can play around with financial terminology, but it’s not even a minimal reason to consider dismissal of a city council’s chairman,» said Ušakovs, adding that several of the ministry’s complaints are ‘childish’. Ušakovs says that in spite of his dismissal, the coalition in the city council will continue working together and managing the municipality. «The team will continue working and accomplishing tasks together,» he said. Incredible, so to say. Like red wine grinder that will never get away. It have been for years like a public secret how rotten point in Rigas satiksme. If Mr. mayor really did not know anything then there is a question for wat he was getting his salary. Just desperately hanging in power but nothing else. And how about those so called positions of his party members? Of course, the large society of ethnic minority supports him never mind what and where he is doing. Earlier I thought that Ushskovs is a smart man but seems like it was only an illusion.